Following on from my post yesterday about our company's sponsorship and presentations, I thought it was worth a post to highlight the sessions other people in the Drupal community have proposed that relate to the building of a geospatial web with the help of Drupal - the main reason I got involved in Drupal in the first place. "This presentation will include an overview of the emerging Geospatial web, and the technologies, standards and communities that are driving it. We'll look at how Google Maps fall short and how to go beyond its basic approach to mapping on the web. We'll cover where Drupal fits in, ways to incorporate other mapping tools and data into your projects. Specifically, what modules extend Drupal, enable it to leverage existing tools and how to use these to do new and interesting things." Jeff has been doing all sorts of interesting work recently with Drupal and RDF for storing geodata, and Andrew is the heavily involved in GeoCommons and Mapufacture, empowering users to share their geographic information. "You have access to tons of information, Eric Gundersen of the online strategy shop Development Seed will talk about how interactive maps, data visualizations, and other online tools can quickly show you the bigger picture around large scale international issues. Eric will demo the new Pandemic Preparedness Mapping site built for InterAction to prevent the spread of a catastrophic disease like bird flu." Eric, and Development Seed in general, have done a lot over recent years to build cool sites that are often centred around geospatial information. The Pandemic Preparedness Mapping site uses maps care of the Nice Map module and also a modified version of the KML module that allows people to access all the data in the site through Google Earth and many other systems that can read KML. "This session will move from GIS concepts to Drupal GIS practice. We will talk about the principles of storing, organizing, and searching geodata, the practical usage of geodata in Drupal applications, and how geographic functionalities are implemented by existing Drupal modules." Brandon Bergren, primary maintainer of the location module, GMap module and geo module will also be one of the presenters. "Leveraging semantic web services such as Thompson Reuter's Calais within Drupal enables you to do amazing things that will be part of the semantic revolution. This session will cover some incredibly powerful things you can do to augment content and create powerful features once you have the semantic context and metadata of the information driving a site." Another example of the intersection between the semantic web, Drupal and geospatial information, this talk will demo the Calais Geo service for geo-tagging and mashing up content. Bevan Rudge will be using some of Drupal's geographic modules to build Google Maps Mashups In and a number of other presentations such as Karen Stevenson's CCK Mashup -- Oh The Things You Can Do! also relate to mapping. There will no doubt be some BOF (birds of a feather) sessions around the growing area of geographic information in Drupal as well, but it already sounds like a great mix of presentations. If you're going, remember to vote for the sessions to make sure they all get the chance to present! When the usage statistics page for Drupal contributions was released recently, I was pleasantly surprised to see how many people were using the Availability Calendars module, and amazed at the difference the Drupal 6 release had on the usage figures. The graph below shows that the usage was quite steady on the Drupal 5 release, but when the version for Drupal 6 was released, it massively boosted the figures. So, if you are the maintainer of a Drupal module or theme, and haven't yet released a Drupal 6 version, it looks like you're really missing out on potential users. According to my drupal.org user profile, it's been three years now since I joined the Drupal community, and in that time I've been involved with building a large Drupal-based collaborative platform at work, helped friends create Drupal sites and developed a number of small Drupal sites in a freelance capacity, as well as contributing a number of modules back to the community, but had not managed to get around to actually migrating my own website to Drupal. Until today, that is. Today marks the soft launch of my new Drupal website, an initial version that has most of the content from the old site but still needs some user interface improvements and the like. The blog is up and running, now also with RSS feeds for each of the main categories and also each of the tags. The photos are all in there, though I'm missing any gallery functionality at the moment, so they're going to be a little difficult to find for now. Watch out for more over the coming weeks and months as I find time to make improvements, expand what's here and tie in with other services on the web like Twitter, Flickr and delicious. The KML module for Drupal allows you to view location-enabled data from your site inside of Google Earth, and it's now available for Drupal 6 - the latest release of the Drupal content management platform. Having realised last week that the Location module for Drupal was already working pretty well on Drupal 6 I set about to update the KML module to start working with it. It had been a while since I'd done much with the module, and have thankfully had some help from another community member - Robin Rainton, or raintonr - who was keen to add some new features, so it was great to get stuck back into it and try out some of the new things that Robin had added since I last touched the module. Perhaps the biggest new features are the caching of KML feeds so whenever you're accessing them in Google Earth you put less of a strain on your Drupal site (especially if you are using Network Links to regularly update the feed), and the ability to choose the style of the markers instead of using the default pins that we used to have. So, if you want to use the KML module on your Drupal 6 site, you can now do that. You'll need to download the latest version of Location module and also the latest version of KML module. There will likely still be issues with this early version, so please let me know if you come across any by posting them in the issue queue on drupal.org. 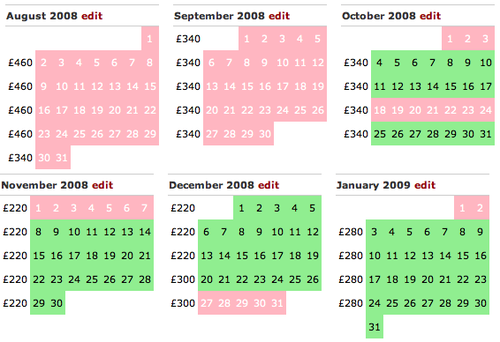 Back at the start of the year when I was building a website for some self-catering cottages on the Isle of Man, I needed to replace some availability calendar functionality that I'd originally coded for the site back in 2000 or so. As I was moving the site to Drupal, the availability calendar solution really needed to be something that was fully integrated as a Drupal module. I had checked out a couple of modules and the two that I found (Availability and OpenResort) didn't really do what I was looking for, so I went about customising the Availability module to do what I wanted. Soon enough, the module had changed shape quite considerably, so it didn't feel like it would fit back into the original module. After about six months of running the module, the new Availability Calendars module got released back to the community last night. If you run a small accommodation provider business (like a self-catering cottage, a bed and breakfast, a guesthouse, etc.) and are using Drupal to power your site, you might find this module quite useful. It will allow you to show an availability calendar for each node of a certain type (e.g. cottages, rooms, etc. ), change the availability for each day, and also leave a note (such as a rental price) next to each week. If you have any issues with the module or would like to request new features, please add a comment to the issue queue. I'm proud to launch the new website for the Bed and Breakfast accommodation at Cronk-e-Dhooney Cottages in the Isle of Man. Recently awarded a four star rating and located in the hamlet of Ballakilpheric near Colby, the cottage is just a short drive from the airport, the golden beach and sunset views of Port Erin, the working village folk museum at Cregneash, the historic capital of the Island at Castletown, and many more things for visitors to see. If you're looking for a comfortable, family-run B&B in the middle of the beautiful Manx countryside - perfect for outdoor activities such as walking, cycling or just as a base for exploring the Island - look no further than Cronk-e-Dhooney. The website is based on Drupal to make it easily maintainable, includes some mapping from OpenStreetMap and also photos that I took in and around the property to help show it off to prospective visitors. 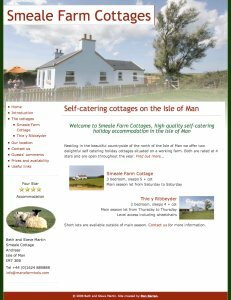 Last night saw the launch of the new Smeale Farm Cottages website (first launched back in 2000), helping market a new holiday cottage that they recently opened. The new site features an improved availability calendar that makes it both easier to maintain and easier for visitors to understand as well as the ability for the customer to edit any of the pages themselves whenever they want to change any of the information. Also featured is a location map thanks to data from the OpenStreetMap project. As you might expect, the website is built using the Drupal open source content management system with the addition of the image module, a customised version of the zen theme and a heavily customised availability module to drive the calendars. I'm hoping to release this availability calendar module back to the community as a new module in the near future. The map above shows the approximate locations of over 400 of the DrupalCon Barcelona 2007 attendees, based on the city or country they entered when registering for this year's DrupalCon. People travelled from every continent except Antarctica (maybe next year?) to visit the conference though most attendees travelled from Europe or the US. If you're reading in an RSS reader, or if you prefer using Google Earth rather than Google Maps, you may want to load up the KML file, otherwise you'll need to move the map around a little to make Google Maps load all the locations for you.